'Binoculars, Prismatic 6 x 30'. Stores reference 6E/293. Marked with Air Ministry King's crown and reference numbers. 6x30 optics. These show some paint loss and general wear but remain quite presentable. The lenses aren't as clear as they were originally and might benefit from a clean but are certainly still useable. Each prism can be adjusted at the eyepiece to allow for individual differences. The left prism can be adjusted but is stiff and requires lubrication. With rather worn original leather neckstrap - broken/detached at one end. 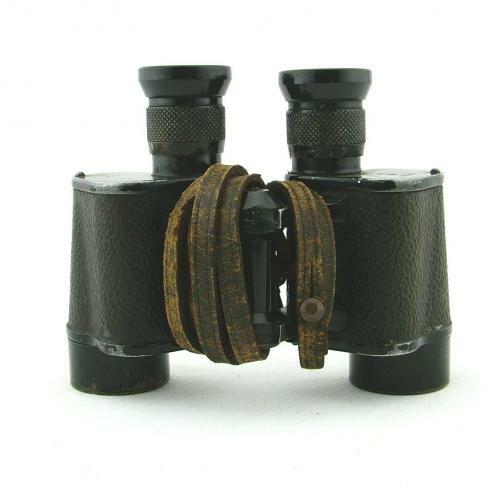 This pattern of binocular was provided for spotting and identifying objects at long rage, from the ground or in the air, and for other reconnaisance duties. Fair used condition. Stock code M21595.